In our opinion (and the opinion of other experts) email marketing remains one of the highest returning marketing options available. But like Martin Zhel stated in his article on mailmunch.com, "Email marketing and social media marketing are like apples and oranges", so while we can compare their numbers it's always important to remember that every business is different and the effectiveness of a marketing method can depend greatly on the context it is implemented in. In this blog article and podcast, we're going to compare and contrast Email Marketing with Social Media marketing to help you decide which may be the best option for you! Profitworks provides Email Marketing services which is one of the highest average ROI marketing mediums available to businesses. If you're looking to make a marketing plan for the first time check out our FREE marketing template. Click here to check it out now! Email Marketing vs Social Media Marketing. Click the link below to listen to the podcast. So why does email marketing provide better value? According to Mailmunch.co it's estimated that only 6% of your facebook fanbase will see your post organically, and the more fans you have the less will see each post. Once you get up to 100,000 fans you can only expect your organic reach to be 2%. Email marketing's average open rate is approximately 21%, which means that a much larger percentage of your audience is viewing your message. Most would agree that while you can create Facebook pages or Twitter accounts that are focused on business, Email marketing is still the most business oriented. Now, this may not matter as much for e-commerce-type businesses, but it's an incredibly important thing to keep in mind for B2B companies. In their article "5 Reasons Email Marketing Crushes Social Media Marketing for B2B" Kissmetrics states, "...when it comes to building business relationships and communicating with partners and clients, the most "serious", "grown-up" medium is email". Some people will read this and think that we're lying, but it's actually easier to gather subscribers for an email marketing campaign than it is to convince people to follow your social media channels. Why is that? Well, one of the major reasons is that more people have an email address than have a Twitter or Facebook account that they use often. This means that people are more likely to be able to supply you with an email address. Check out this video from Derek Halpern of SocialTriggers where he explains why it's important to build an email list and how building an email list is actually easier than building a social media following. Determining a marketing method's ROI is the best way to discover its value. According to Campaignmonitor.com, email marketing has been delivering the highest ROI for marketing for the last decade. On average you usually see a return of $38 for every $1 spent. This is an outstanding 3700% ROI! So why is it's ROI so high? Simple, it's a much cheaper option than investing in social media marketing and provides a much better conversion rate than social media marketing. These two things combined make for a high revenue-producing marketing method. In fact, when you look at the chart below you'll see that social media marketing doesn't even come close to email marketing. 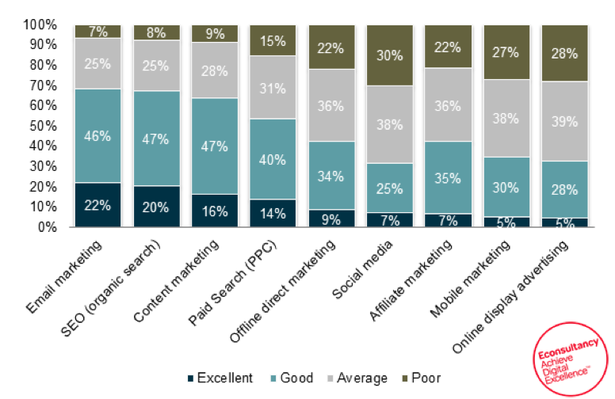 In an Email Marketing Census done by Econsultancy, they discovered that other marketing methods such as SEO, content marketing, paid search (PPC), and offline direct marketing provided companies with a better ROI than social media marketing. Now that you understand why Email Marketing offers more value than Social Media Marketing, it's time to get your campaign started! If you're looking for a top tier digital marketing company to help you with your email marketing campaign, then you've come to the right place! Here at Profitworks we expertise in SEO Marketing and Email Marketing but we offer other marketing methods as well. Click here to get in contact with us to discuss how we can help increase your revenue today! Do you feel you should have a marketing plan but you currently don't? Do you wish you knew what a marketing plan should look like and what components should all be included? The Profitworks Marketing Plan Template has everything you need to create your own marketing plan. The template includes a clear outline of all the components of a small business marketing plan with step-by-step instructions on how to fill in the template and build a marketing plan of your own! If you are interested in getting more customers for your business download our free marketing plan template now! It has already been downloaded by over 5,000 people. If you need assistance in completing your plan consider our marketing plan training program.